le vendredi, 2 mars 2007.
le lundi, 5 mars 2007. Tu pourrais me dire ou tu en as vu?? le mardi, 6 mars 2007. La photo que je présente a été prise sur Frederiksplein mais je sais qu'il y en a d'autres ailleurs comme sur Wijzelstraat par exemple... Celle de Mieke est peinte sur le bâtiment des archives de la ville. Hello Alix, I saw your comment on my blog and I don't have a clear answer for you. I don't know much about the stencil but noticed that it popped up around Amsterdam about a year and a half ago. I spotted it in maybe four or five locations and I liked it very much because it made me think of peace between the Jewish and Palestinian people. le mardi, 4 août 2009. 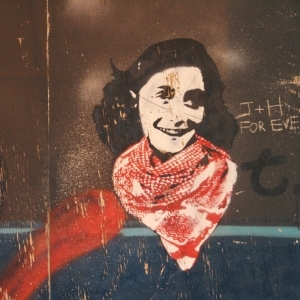 The image of Anne Frank with the keffieh was originally printed on free postcards named Boomerang Cards and spread to restaurants, bars, cinema's, libraries and schools througout the Netherlands. The image was created by an artist named T. (or T. 2008). A a postcard it created a bit of a political stir because the Centre for Information and Documentation Israel (CIDI) reacted in anger, saying it was historically incorrect and abusive. The artist responded - via Boomerang - that he didn't see it that way: he painted it as a hopeful image about future peace between Israel and Palestine. le vendredi, 15 décembre 2017.